Our neighbor Max and his "Gram Clark" stopped by to craft with us this morning. 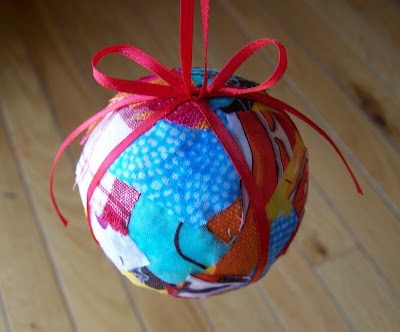 The idea for these "scrapball ornaments" came from a site called The Red Thread. and glued them to 2 1/2 inch styrofoam balls. Gram had made these kind of ornaments before, so she was a big help. prop the balls on while we worked. Less messy that way. It was still gooey and sticky, but the end result was lovely, don't you think? and it went nicely with today's story. the president and prophet of our church. He had heard about the events of this story and then researched it by interviewing descendants of this family. He first told the story at the Christmas devotional of 1998. This true story is about a destitute family living in Canada in the late 1920's. Their family members in the States offer to send them what they need for Christmas. The family only asks for the bare necessities: a bit of coal, socks, used quilts without holes, and perhaps a hand-me-down dress for the oldest girl to wear. The family waits and waits with hope that something will arrive before Christmas Day. What follows is a display of compassion and service that is truly moving. President Monson reiterates that "when we are in the service of our fellow men, we are truly in the service of our God." These are adorable! I found you through 12 Crafts Til Christmas. 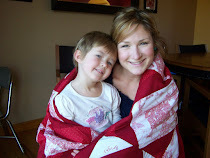 I would love to have you link up to my fist linky party! I love this book! These ideas are all so creative!! !